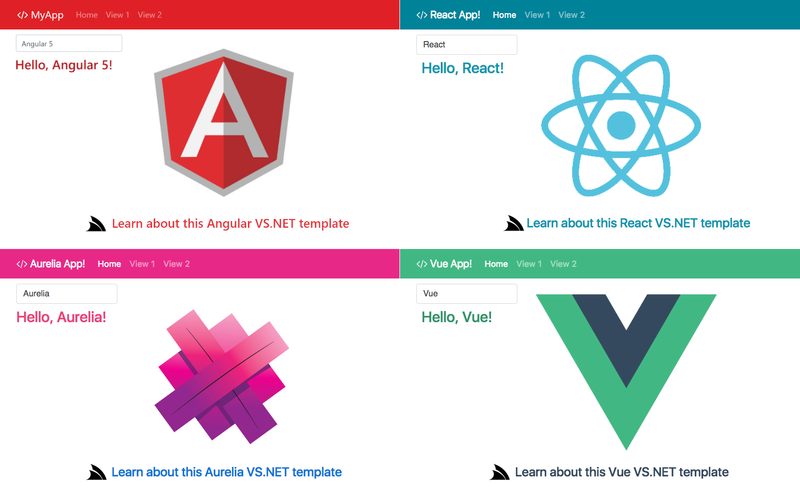 We've developed new Angular4, React, Aurelia and Vue.js Single Page App VS.NET templates for ASP.NET which have been re-imagined to incorporate the latest gold standard in modern Single Page App development and integrated to provide the ideal development experience within VS.NET, optimal bundling and packaging for production including one-click Web App deployments using MS Web Deploy. We've added complete support for VS.NET 2017 with the ServiceStackVS VS.NET Extension and have migrated all ServiceStack code-bases for all of ServiceStack's NuGet packages to VS2017's new MSBuild format which is now being used to generate the different .NET 4.5 and .NET Standard platform builds used in all .NET Core packages including our multi-target Test projects. The release notes contains a detailed overview of Webpack and how to use it from within VS.NET and command-line which support both of Webpack's popular developer options of watching for changes and regenerating its outputs as well as Live Reload support using the Webpack Dev Server which automatically reloads the current page after processing any changes. Gistlyn was upgraded to use the new Webpack-powered React Desktop Apps template. We've replaced our internal string parsing in ServiceStack.Text's serializers to use .NET Core's new StringSegment class (polyfilled in .NET 4.5) which dramatically reduces the memory allocations needed and execution time for deserialization. Parsing implementations of primitive .NET Types like integers, decimal and Guid types were also replaced with custom implementations utilizing StringSegment which sees their performance improved by 2.5-4x. These improvements are best seen in large complex types with nested arrays like MiniProfiler's DTO where memory allocations were reduced by 5.3x and performance improved by 33%. We've resolved a vulnerability using public object properties on DTOs where we've needed to adopt a whitelist to limit the Types that are allowed to create instances of. Please see the release notes for full details. We've consolidated functionality for populating the fields and properties of a runtime Type behind a formal API which includes multiple cascading implementations so it's able to use the fastest implementation available in each supported platform, i.e. for most .NET platforms we use the Reflection.Emit implementations when possible, when not available it falls back to using Compiled Expression trees, then finally falling back to using a Reflection-based implementation. OrmLite's Typed SqlExpression has been expanded to support up to 15 tables in a single SQL Condition and up to 4 tables in a JOIN expression. downstream servers whose behavior can be customized with custom C# hooks to control how requests are proxied. ProxyFeature registers an async/non-blocking RawHttpHandler which bypasses ServiceStack's Request Pipeline that in ASP.NET is executed as an ASP.NET IHttpAsyncHandler so it should be flexible and performant enough to handle many demanding workloads. Josh Engler contributed support for Autowired Request and Response Filters which lets you handle Request DTOs in a Typed Filter similar to how Autowired Services handles Typed Request DTOs with access to IOC injected dependencies. Returning a static Virtual File or FileInfo in a HttpResult now sets the Last-Modified HTTP Response Header whose behavior instructs the pre-configured HttpCacheFeature to generate the necessary HTTP Headers so HTTP Clients are able to validate subsequent requests using the If-Modified-Since HTTP Request Header, allowing them to skip redownloading files they've already cached locally. The home page and directories are no longer cached in DebugMode to better be able to reflect changes during development. The WebServiceException Message returns the the more appropriate ResponseStatus.ErrorMessage if available. The previous StatusDescription text can be retrieved from the WebServiceException.StatusDescription property. That's a high-level overview, please see the # v4.5.10 Release Notes for the full details.